I’m now wondering about pre-1931. If the twentieth century could have been “irrevocably altered” by Churchill’s brush with death in a traffic accident between the World Wars, what if Churchill had never been engaged in politics in the first place? For the answer, one has only to get a copy of The Churchill Legend and read it. Francis Neilson, who was a member of Parliament at the outbreak of the Great War, claimed to have known Churchill longer than anyone alive. The list of disasters Churchill presided over prior to the Second World War includes the fiasco at Gallipoli, the Lusitania’s sinking (when Churchill was First Lord of the Admiralty), and the issuance of the Balfour Declaration in 1917 by the British War Cabinet, which opened a Pandora’s box from which has sprung endless injustice and bloodshed in the Middle East. Not that Churchill deserves the sole credit for these disasters, but his fingerprints are there. He was certainly involved at the highest level. Both the sinking of the Lusitania and the Balfour Declaration were the byproducts of a desperate strategy to drag America into the Great War. 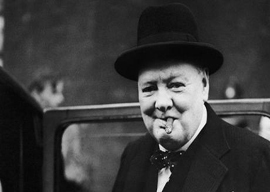 One gets the impression from reading Neilson that Churchill’s entire public career”grounded in both World Wars”shows indisputable evidence of incompetence, opportunism, ruthlessness, mendacity, and bad judgment. Yes, history is repeating itself.